Sporty and young, this backpack is perfect for the active lifestyle. Padded, adjustable backpack straps. Large main zippered compartment. 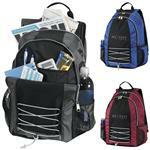 Front features zippered pocket with organizer, slash pocket with buckle closure and pen loops (pen not included). Side mesh pocket for accessories. Non-PVC fabric backing. This product is kid-friendly/CPSIA compliant. A RUSH PROMOTIONAL ITEM - FREE 1-DAY RUSH PRODUCTION AVAILABLE! Available Colors: Red, Black, Royal Blue with Black Trim. 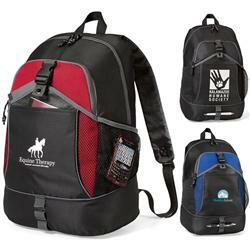 Available Imprint Options: Color Print or Embroidery. Additional color costs based on quantity order, please inquire. Embroidery available.